In many companies, data governance begins with a focus on roles and responsibilities. 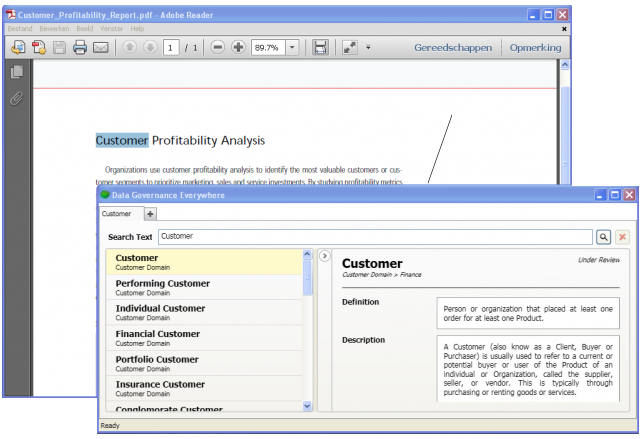 Critical data assets, such as the Business Data Glossary, are captured in the easiest available tool, such as Excel. At some point, the limitations of these “repositories” will show you that it’s time to move on to a better option. 1. You don’t know who is adding, updating or commenting on terms and definitions. How do you manage who is able to add, modify or otherwise contribute to a term? How do you keep track of who has made which changes? Who is responsible for the final approval and how do you stop changes being made to a definition once it is signed off? If multiple stakeholders are updating the same document then it is possible that one person may overwrite the changes made by another. In some cases, this may result in critical commentary being lost or ignored. 3. Cannot link to other data assets, such as logical data model. Glossaries offer the most value when placed in context. What database fields are used to derive calculation X? Who are the business stakeholders that must be consulted regarding changes to definition A? Does the same terms have different definitions (and uses) in different environments? Are multiple stakeholders updating the spreadsheet and sending versions to the data steward for consolidation? Which is the most current version? Did a version get lost in the email? Did it get sent to the right person for approval? How long ago? Does the data steward have time to figure this all out? Simple workflows make adding, consolidating and approving new terms quick and easy. The correct stakeholders are engaged at the right times to ensure user engagement and support. No wasting time and no frustration for anybody. .For example, business requirements documents should use the correct terms, as per the agreed definitions. For this to happen, business analysts and other users must easily be able to search for, find and embed terms in their documents. Should we be engaging with a client, or a customer? Is there a difference? If it’s not clear, who can I ask? Excel is not a searchable knowledge base.